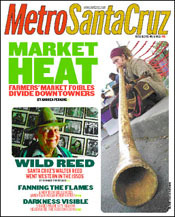 Farmers' Market lifestyle controversy raises questions about character of downtown Santa Cruz. A holiday at Camp Paradise. Bruce Bratton: The San Francisco Silent Film Festival opens; construction soon to begin on Del Mar Theatre. Sights & Sounds: Catching up to Ani and Andrea in one week. Bistro Still a Pearl: The tasty upstairs bistro continues to be a delectable work in progress, adding consistency to its long list of charms. Word of Mouth: Shakespearean vintages, the 'stinking rose' blowout and Bastille Day at Theo's . Western Walter: Santa Cruz actor Walter Reed worked for John Ford and Budd Boetticher in the heyday of the Western film. Burning Men: A local filmmaker documents an elite American Indian firefighting crew. Night And Day: Shakespeare Santa Cruz explores the dark and light sides of human nature.